There’s something about winter which makes me crave Thai food – the punchy flavours just make you think of sunshine. I’ve put a couple of noodle soups with prawns on the blog already (Tom Kha Soup, Noodle Soup), but this one is particularly easy, fragrant and fresh. 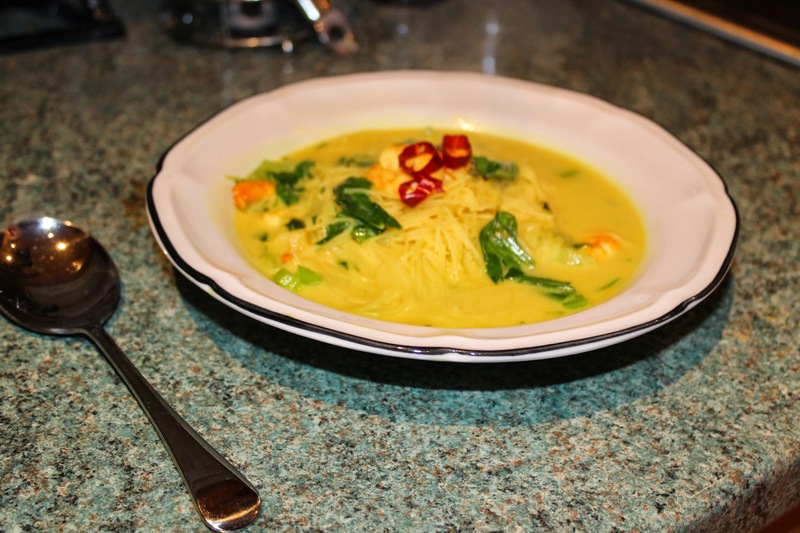 The addition of tumeric makes the soup particularly bright and adds a distinctive, earthy flavour. This particular soup is more similar to the Tom Kha Soup of the two I’ve previously cooked, but I’ve really stripped it back to make it seriously easy and quick to make. This will serve 3-4 and takes 15 minutes to make. 1. Finey slice the ginger, garlic, chilli and coriander stalks and add to a large pan with the sesame oil and bruised lemongrass. Put on a medium heat for a couple of minutes until it starts to sizzle and becomes fragrant, then add the tumeric. 2. Stir in the stock and coconut milk; bring to a simmer. 3. Add the noodles and prawns. 4. When the prawns have turned pink, chop the pak choi and coriander leaves and add to the pan. Add fish sauce to taste and you’re done!